This article, as it originally appeared in the New Haven Independent on November 17, 2014, can be viewed here. On a Wednesday afternoon in late October 2014, a group of residents from the Hill North and Dwight neighborhoods convened in front of Career High School on Legion Avenue to contemplate the fate of a 5.39 acre parcel of land recently sold by the city to CenterPlan Companies of Middletown for development. Less than 8 months earlier, these same residents gathered inside the school along with others from their neighborhoods and West River at the invitation of Mayor Harp to learn about a new proposal for Route 34 West. By the time of the March 9th, 2014 meeting with the Mayor, when many residents first became aware of the proposal, City approval for the project was already well underway with the City Plan Department petitioning for zoning changes to Route 34 West corridor and a Land Disposition Agreement (LDA) having been drawn up between the City and CenterPlan. This lack of public input into the process has been the primary source of contention for the group as they stood across the street from the future home of the Continuum of Care headquarters. Another area of concern for this group is the actual plan for development approved by alders of the Community Development Committee, which calls for strictly commercial uses on the site in the form of office, retail, permitted parking, and hotel space. Furthermore, the plans lack any lateral, non-vehicular circulation infrastructure across the site for pedestrians and cyclists, thereby ensuring that the block not only lacks residential uses and will be unoccupied at night, but will also be inaccessible and not easily traversed by anyone without a car. For one member of the group, Vice Chair of the Hill South Management Team, Helen Martin-Dawson, it seems like “the only thing we get over in the Hill is parking lots for Yale-New Haven Hospital.” While this perception of the Hill is undoubtedly true in recent history, it has not always been the case. The Reverend John Davenport, co-founder of the New Haven Colony, gave his first sermon to the puritan settlers of the New Haven on April 25, 1638 under an oak tree where College Street terminated near the West Creek (present day intersection of College Street and MLK Boulevard). Earlier that year, the creek served as the arrival point for the colony’s settlers. New Haven’s original wharf was built along the West Creek and served as a main street of sorts for activity in the early years of the town. Between the creek and the West River lay pastures for livestock grazing and fields for farming. In the antebellum era , Morocco Street ran parallel to the creek – named for the tanneries lining the embankment. Evergreen cemetery was founded by a group of prominent New Haven citizens in 1848 near the West River; at the time it was accessible from the town center by a lose network of roads. In the 1880s the West Creek was filled in and developed, connecting the Nine Squares to the Hill neighborhood. Growth also spread northwest from the Hill along present day Legion Avenue, which was then known as Oak Street – named for a grove of oak trees located in what would become West River Memorial Park. In an attempt to distance Morocco Street from its tanning industry past, it changed it’s name to that of its western neighbor Oak Street. As the industrial city of New Haven grew in size and intensity around the turn of the 20th century, efforts to plan future growth culminated in the commission of a report by two top urban planners of the era, Cass Gilbert (architect of Union Station and the New Haven Free Public Library) and Frederick Law Olmsted Jr. (designer of the layout for Edgewood Park). The Report of the New Haven Civic Improvement Commission was published in 1910 and in it the authors called for radical changes to the Oak Street area. The Report detailed plans for demolishing a small swath of haphazardly built tenements and warehouses between the New Haven Green and what would become the site for the train station. Built in its place would be shops, cafes and hotels along a series of squares connected by a formal promenade in the form of a wide boulevard leading to a new train station. Gilbert and Olmsted also suggested demolishing the block bounded by Greenwood, Scranton, Orchard and Oak Streets for the creation of a much needed new park to serve the surrounding neighborhoods. The Report also called for continuing Oak Street over the West River with a bridge to connect with West Haven. New Haven’s initial attempt at City Planning was a failure as none of these plans were ever fully realized and the city continued to grow unabated into the 20th century. As Eastern and Southern European laborers moved into the Oak Street area in the first quarter of the 20th century, the neighborhood grew ever denser. Oak Street’s storefronts bustled with people and activity while housing became cramped and industry expanded. However, when commerce migrated to Congress and Washington Avenues and industry eventually sought more sprawling sites like in Newhallville, Oak Street began to decay. Unfortunately for Oak Street, New Haven’s second attempt at City Planning in the mid-century would prove more successful, at least in terms of implementation. The Housing Act of 1949 allowed municipalities to apply for Federal funding to be used in slum clearance and redevelopment projects. State and Federal highway funds were also used during this time to place the interstate highway system through cities. In New Haven, urban redevelopment was implemented through Mayor Richard Lee’s Redevelopment Agency, headed by Edward Logue, in coordination with the Connecticut State Department of Transportation. 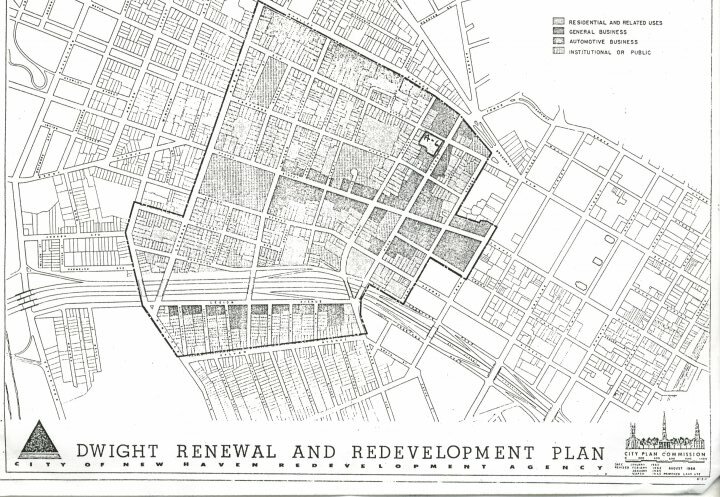 The Church Street, Oak Street and Dwight Renewal and Redevelopment Plans cut through the same areas previously identified in 1910 as in need of reform. Instead of the small scale demolition proposed by Gilbert and Olmsted, however, the Redevelopment Agency called for widespread removal of the entire Oak Street neighborhood. A limited access highway was plowed through the eastern end of Oak Street with plans of extending it over the West River to connect with the Route 34 parkway. Adjacent to this highway stub developed an office park of high-rise towers sitting in seas of asphalt and parking garages. To the west, land was cleared in anticipation of the continuation of a highway that never came. The State stopped funding the Oak Street Connector project in the 1970s, despite the city demolishing the Legion Avenue neighborhood. Instead, the Frontage Roads that were to serve the highway became designated as Route 34 in New Haven. No crossing was built over the West River, requiring a part of the Boulevard to serve as a jog through in the route. All but cementing the highway’s incompletion was the construction of the Air Right’s Garage in 1981. Though as late as 1982, the Federal Highway Administration approved, at least from an environmental impact perspective, of a six-lane limited access expressway bridging the Oak Street Connector to Route 34 in West Haven over the West River. In 2002, due to a State budget crisis, the land between Route 34 was transferred to the City of New Haven. In 2004, Pfizer constructed a building at the corner of Park Street and North Frontage Road. The building is surrounded by a surface parking lot, the entrance is oriented away from the street, and a green berm around the periphery of the building provide for an awkward pedestrian experience. In 2008 and 2009, the city held a series of public workshops to develop a Route 34 West Municipal Development Plan (MDP). Presentations during the workshops consistently called for maintaining the one-way state arterial road system, concentrating commercial uses to the east and residential uses to the west, and developing large parcels of big box buildings. Plans for the MDP lacked the fine grain detail of walkable, safe streets and mixed used development that would make the area a viable bridge between communities. As a result, the MDP process for Route 34 West eventually lost momentum. Lot E, located one block to the West of the Pfizer building, was completed in 2009. The development includes a large parking garage and a temporary-residence building with no street presence, following the precedent set by Pfizer. Next year, a 14-story office building for the Alexion pharmaceutical company at 100 College Street will be completed. Built over the end of the highway stub, the project is the first phase in a plan to develop the Oak Street Connector dubbed Downtown Crossing. The building mimics much of what was built during the urban redevelopment era – a large single use building oriented around the highway and served by a parking garage. The same year Lot E was completed also saw the opening of the Smilow Cancer Center, which nuzzles up to the Air Rights garage. Blocking the brutalist façade of the garage, the Cancer Center provides an interesting building envelope and adequate pedestrian accommodations along Park Street. In 2008, the City held a competition for the redevelopment of the Coliseum Site adjacent to the Oak Street Connector. Six qualified development teams emerged from the competition with Northland Investment Corporation in association with Robert A.M. Stern Architects winning. However, due to the market turndown that year, the project was scrapped. By 2013, another proposal for the Coliseum site had developed – this time lead by Montreal-based LiveWorkLearnPlay (LWLP) and Newman Architects. As the city’s preferred developer, LWLP was obligated with developing the project with input from the public. As a result, the project was brought around to management team meetings in the Hill and Downtown to hear feedback from residents. LWLP’s Coliseum redevelopment project calls for two phases; in phase one, a hotel and multi-story apartment buildings above retail are being built around a public square and service lane followed by office and residential towers on top of underground parking in phase two. The project aims to create an urban village connecting the Ninth Square with the train station across the Oak Street Connector with a new at-grade crossing at Orange Street. In December of 2013, the city released the Hill-to-Downtown Community Plan, a document that sets out to provide a framework for future development in the area between Route 34 and Howard, Columbus and Union Avenues. The plan envisions developing the area around Amistad Park as a biomedical, office, and residential community; continuing to develop Downtown Crossing with high-rise office buildings; and redeveloping Church Street South Housing into a mixed-income neighborhood oriented around a park. Overall the aims of the plan are good – parking is located in a handful of garages placed throughout the district, uses are mixed, and connectivity between Downtown and the Hill is improved with additional street crossings through Route 34. One important improvement to the Hill-to-Downtown Community Plan that should be made, however, would be to cut Orange Street through a parking lot of the Tower One and Tower East property to connect with a new street leading to the train station as part of the Church Street South Housing redevelopment (see image above). In this scheme, the existing South Orange Street would become a service road for loading docks and accessing parking. Both the Coliseum redevelopment project and the Hill-to-Downtown Community Plan represent good public processes that have led to positive outcomes for the city and the nearby neighbors. After initial failures to rename Whalley and Dixwell Avenues, the City changed North Frontage Road to Martin Luther King Jr. Boulevard in 2011. The change brings with it connotations of inclusion and bringing different groups of people together in safety and comfort. Route 34, in its current configuration, is anything but those qualities. The largest number of car accidents in the city occurs along the Route 34 Corridor, several pedestrians have been maimed and killed trying to cross the roads, and pollution in the city is most concentrated here. Hope still remains for the corridor if the city can gain control of the roads themselves as it did with the land between them. Returning MLK Boulevard and Legion Avenue to city streets in both designation and design could provide an adequate platform for accessible and inclusive development to attract residents from nearby neighborhoods, draw newcomers to the area, and encourage visitors from elsewhere. First, the path of travel through the Route 34 Corridor would have to be rerouted to the Boulevard and West Haven. Drivers should only use the corridor when their destination is Downtown or a neighborhood to the West – no longer should they attempt to traverse the corridor. This would reduce traffic volume on the streets and enable narrower travel lanes, on-street parking, and additional cross streets. According to studies by Welsey Marshall and Norman Garrick, “both increased intersection density and additional street connectivity [are] generally associated with more walking, biking, and transit use.” Furthermore, they found that “safety outcomes [are] associated with street network density and to a lesser extent, street connectivity.” Additional streets will encourage greater safety and more use by pedestrians, cyclists, and transit riders. In order to accommodate these new users cycle tracks, bike lanes, and bus stops will be needed. 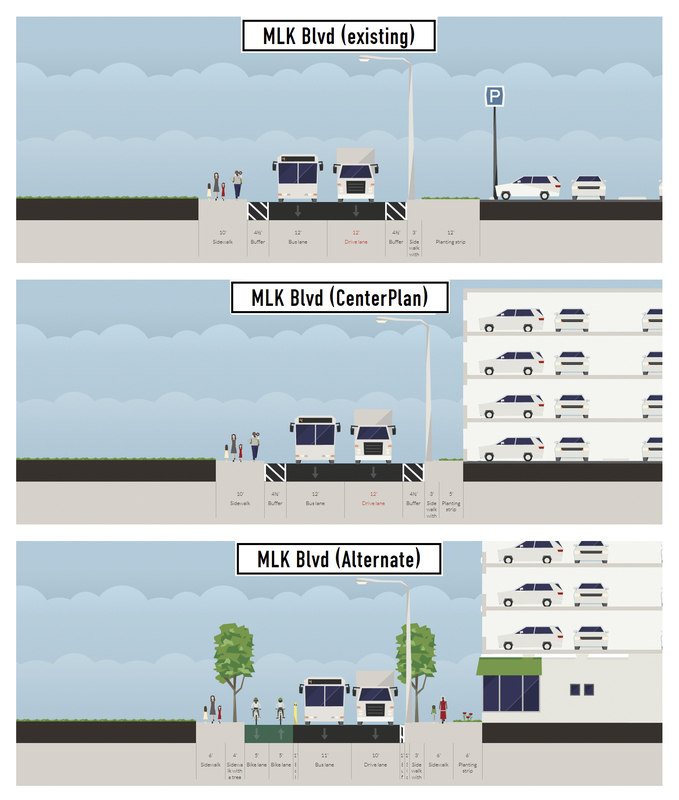 A less traversed corridor and additional streets with cycling, transit, and pedestrian infrastructure would allow Legion Avenue and MLK Boulevard to remake themselves in a radically different way. A half century ago, Legion Avenue was the center of the Hill North neighborhood, which extended all the way north to Derby Avenue and George Street. The creation of the Route 34 Corridor separated Hill North, leading the northern section to form its own identity known now as the West River neighborhood. Currently, Legion Avenue has two travel lanes running eastbound towards Downtown New Haven with on-street parking serving the predominantly residential uses lining the south side of the road. Due to the Evergreen Cemetery occupying a large portion of the street frontage of Legion Avenue and the existing housing that lines the street, it would best served as a residential street similar in character to Elm Street between Howe Street and Sherman Avenue. Travel lanes could be narrowed to 10 feet, making room for a 5-foot bike lane in addition to the existing on-street parking. North Frontage Road was a new street cut-through the Hill North neighborhood to serve a highway that was never built. Today, MLK Boulevard consists of two wide lanes running westbound towards the Boulevard. MLK Boulevard could become similar to what Legion Avenue was at mid-century – the Main Street for a vibrant neighborhood. In order to achieve this, the street would need to be converted to two-ways between the Boulevard and Dwight Street with two lanes continuing to run westbound and one lane running eastbound. A 25-foot setback between the curb and the building line could accommodate on-street parking, a two-way cycle track, a tree planter strip and a sidewalk. On-street parking and bus stops could be cut into the existing curb, while others portions could be maintained to serve as bump-outs for crosswalks. Side streets such as Greenwood, Auburn and Porter Streets would be residential in character, while major crosstown streets like Sherman and Orchard might be more appropriate for commercial development. Furthermore, density and size of buildings as well as intensity of uses would generally decline as one moved westward along the corridor from Dwight Street to the Boulevard. Route 34 West still needs a community plan for development, not piecemeal encroachment of institutional and commercial development as seen in the Pfizer and Lot E projects. Continuum of Care is a non-profit organization dedicated to providing comprehensive residential and support services to persons with psychiatric and developmental disabilities. Currently, the organization’s staff is spread across several buildings throughout the city. The eastern most parcel of Route 34 West offers a site for which Continuum of Care can consolidate offices into a single headquarters and remain within the city. CenterPlan has proposed a plan to develop the site in phases that include the Continuum headquarters, a retail pharmacy, and possible future space for a parking garage, hotel, and medical and office buildings. A consolidated facility for Continuum is much needed for the organization to remain in the city, adequately carry out its mission, and grow in the future. The four-story office building will sit at the corner of Legion Avenue and Dwight Street with parking provided in the center of the block. This initial phase of the development is appropriate for the city and the site. The rest of the proposal, however, falls short of meeting basic goals set out for the corridor by the city as it represents a continuation of the piecemeal development that produced Lot E and the Pfizer building. Little to no consideration has been given for the impact of developing a site located along a major thoroughfare and between two neighborhoods that 1) includes no additional side streets, 2) contains no residential uses, and 3) provides no lateral pedestrian or cycling infrastructure. The proposed retail pharmacy for the corner of Orchard Street and Legion Avenue is typical of what is found in any suburban strip mall where the main entrance faces a surface parking lot and the building turns its back to the street. The absence of sidewalks along Legion Avenue and MLK Boulevard ensures that pedestrians will have difficulty accessing and traversing the site. CenterPlan’s proposal shows no residential uses and the only green space consists of strips of plantings strung throughout the site, not concentrated in one area so as to provide usable public open space. In response to the deficient design of the CenterPlan proposal, a community workshop was held on June 28, 2014 in the Dwight neighborhood to discuss ways of incorporating the goals of the LDA, MOU, and design guidelines for the Route 34 West Corridor into the existing plan. 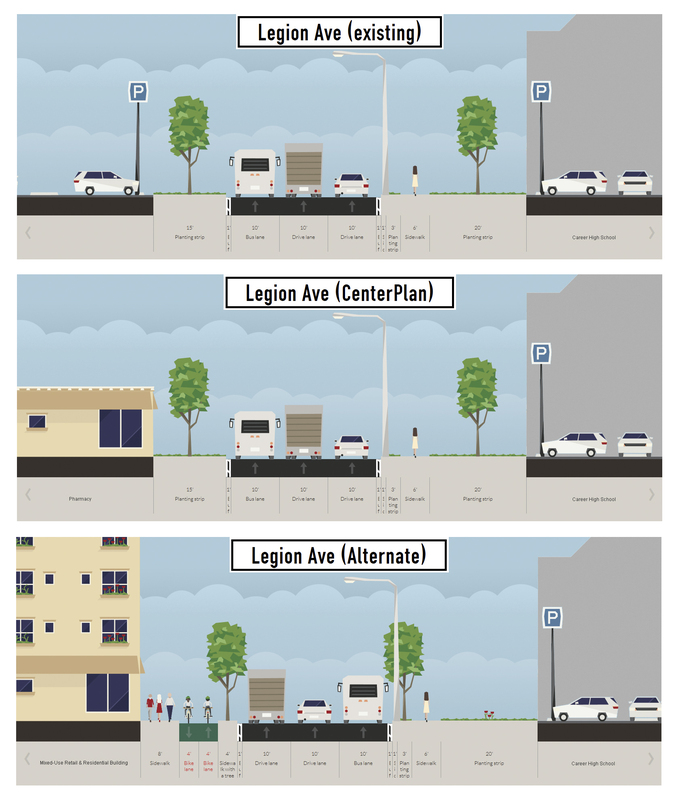 Working within the general parameters of CenterPlan’s proposal, participants at the community workshop suggested including a 20-foot setback along Legion Avenue and MLK Boulevard to accommodate a planting strip for street trees, a two-way cycle track and a sidewalk. This would allow for circulation through the site to access future development to the west and allow non-automobile users to enter the site itself. Next, the group suggested cross streets through the parcel to break up the super block. By projecting Waverly Street through the site, it would align with the existing entrance to the Career High School parking lot and a wide pathway that runs along the school to Elliot Street. Day Street intersects with Motley Place close to MLK Boulevard and does not align with another street across the corridor, but it could serve as a place for a pedestrian crosswalk for students to get to Career. The final cross-site suggestion was to rework Ward Street to line up with Dwight Street in order to improve connections between the Hill and Dwight. The final suggestion to emerge from the workshop was the inclusion of additional retail space on the ground floor of the parking garage and office building in addition to a residential component on the western third of the site. In summary, the workshop stayed within the box of CenterPlan’s proposal while providing residential space and multi-modal infrastructure throughout the site. This alternate proposal would develop a true mixed use community that is both accessible and connective to the Dwight and Hill North neighborhoods. After gaining the support of Elm City Cycling, the community group brought their alternate proposal to the attention of Robert Landino of CenterPlan during an August 27, 2014 meeting at a Continuum of Care office. Upon being informed that CenterPlan would be proceeding with their current proposal as previously presented unless the City intervened, the concerned residents of Dwight and Hill North sought audience with Mayor Harp. After the first meeting with Toni Harp scheduled for September 15th was cancelled, the community group was eventually able to meet with the Mayor’s Economic Development Administrator, Matthew Nemerson, on October 20th. Despite the fact that the current CenterPlan proposal does not meet the goals laid out in the LDA between the City and CenterPlan, nor include basic transportation infrastructure such as sidewalks, the Mayor’s office has expressed no interest in encouraging a slight reworking of the plan to include these elements. Furthermore, the rushed sale of this parcel by the city may be indicative of a pattern of one-time sales of city land to close budget holes, as seen in the cases of central Broadway and portions of High and Wall Street, which were both sold to Yale University. This would make Mayor Harp’s claim that a projected $2 million surplus for the end of the current fiscal year was not made “with one-time revenues”, somewhat suspect. The sale could be interpreted as balancing the city budget on the backs of the Dwight, West River and Hill North neighborhoods – effectively selling the communities’ futures for one-time revenue. As the location of John Davenport’s first sermon to settlers, the site of the worst urban redevelopment projects in New Haven, and the city’s most recent memorial to Martin Luther King Jr., the Route 34 Corridor is deserving of a more thoughtful planning process. Using the Hill-to-Downtown Community Plan as a precedent, the city could develop a plan for the future growth of the Route 34 West Corridor that envisions it as the center for a vibrant neighborhood instead of a pair of State arterial roads. The CenterPlan site in particular deserves a more inclusive process like the one exemplified in the Coliseum site, which included workshops at numerous management team meetings throughout the neighboring communities. As it stands, the current CenterPlan proposal does not meet minimum qualities of a vibrant mixed use urban development as outlined in the LDA due to lack of sidewalks, a dense street network, residential uses, and usable open space. However, with slight tweaks to the current plans, the Continuum of Care proposal could be built as planned with sidewalks and a cross street included to provide a proper framework for future development on the site. The community group has come up with suggestions that work within the CenterPlan proposal to ensure that the project is accessible, active throughout the day and occupied at night, and does not impede access to future developments along the corridor to the west. This corridor is too important and vital for the future of the city to wait around for Route 34 West to develop as a series of institutional and commercial blocks and parking lots, which prompted the community group’s gathering in front of Career High School on October 29th. An opportunity exists in the Route 34 West Corridor to bring three neighborhoods back together with an inclusive and vibrant commercial, recreational, civic and residential center that has the potential to attract different groups from neighborhoods near and far. A place such as this would certainly be keeping with the legacy of Reverend Martin Luther King Jr. more than the polluted, divisive, and dangerous conditions that define the corridor and are perpetuated in current proposals.